Often, Telcon's value begins in the design stage where we work hand-in-hand with your engineering staff to provide innovative and cost effective process solutions. We have many years of experience working through complex design parameters and road blocks to manufacturability. Our team of professionals is adept at assisting customers with solutions to improve manufacturability and maximize long-term cost savings. Telcon's culture of customer service continues forward and results in a seamless transition from prototype to initial product release to production ramp-up. When transitioning existing product, our project focused approach will result in the application of continuous improvement initiatives to identify potential areas to reduce total product cost. Whether your project involves design assistance to optimize manufacturability of product or accelerated schedules to improve time to market, we tailor a solution and offer flexibility to all of our customers. When you require custom kitting, advanced logistics or the production of field service replacement units long after production models reach end of life, we will provide the value added services to meet the specific needs of your project. 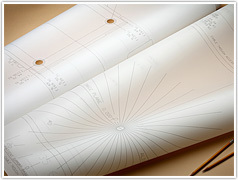 Telcon also offers large scale plotting and template services utilizing a variety of different media. Common applications include mylar layout templates with cut outs and hole punches. Many templates are then kitted with other items to create field installation kits used for placing equipment.